Brooks recently released Adrenaline 12. Although this is still a great shoe for the narrow, shallow foot https://drshoe.wordpress.com/2011/11/17/determining-proper-shoe-fit-width-and-depth/. There are some changes to the lower part of the shoe which warrants mention. My video below identifies the changes. Just had my first look at these sleek, well-made and expensive cleats. All I can say is Adidas, what did you do? The concept is great (lightweight, yet rigid), the style is great (cool colors, streamlined look) but the back cleats are manufactured to sit uneven which will be a major problem for a lot of Soccer players out there. The above image shows a new-out-of-the-box pair placed on a flat surface. New cleats should NEVER do this. In fact when cleats wear this way, they should be immediately replaced. Adidas Product Defect Department assured me that their cleats are designed level, however a trip to the Adidas Sport Performance Store in San Francisco, confirmed that every new pair of AdiPower Predator’s was manufactured in this way. 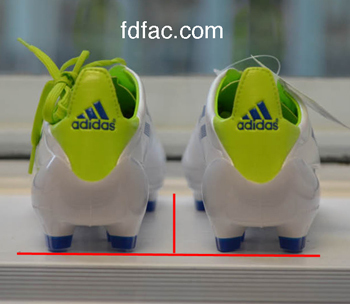 Here’s an image of a pair of Adidas F50 AdiZero TRX FG which rest level on a flat surface. This is what you want to look for when shopping for shoes. If you are excessively pronated or experience problems due to pronation (instep pain, arch pain or inner knee pain) then you will want to steer clear of AdiPower Predator TRX FG . For this reason, I can’t endorse this soccer shoe. Doug is not alone in his frustration of not being able to solve his neuroma pain by changing his shoes. Unfortunately, even with shoe changes or orthotics, neuroma pain can continue to worsen. 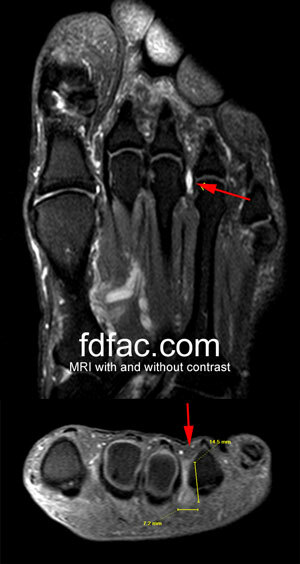 A neuroma is an inflamed nerve in the forefoot. Symptoms include burning and tingling in the toes, or feelings of walking on a bunched-up sock. For some people, the discomfort is more noticeable while wearing shoes, for others the discomfort is more pronounced when barefoot. For everyone, however, the more frequent and the longer the symptoms persist, the worse the prognosis. When this happens, treatment recommendations include cortisone injections and medical grade alcohol, or sclerosing injections infiltrated into and around the nerve. My area of expertise, aside from shoes of course, is biomechanics. I received specialized training in podiatric orthopedics and in orthotic evaluation and treatment. If you are considering custom orthotics, or if they have been recommended to you, you will want to make sure a thorough evaluation is done. This video, although longer than my earlier videos, provides comprehensive information about how the custom orthotic process works in my sports medicine clinic. Understanding this process will make you a more informed consumer, and hopefully guide you to someone who is equally qualified to do this most important rehabilitation step. Although many specialists make orthotics (chiropractors, physical therapists, and pedorthists, to name a few) they just don’t have the knowledge or training to be able to do this as well as a qualified sports medicine podiatrist – see www.aapsm.org for more. So it’s worth your time to not only find the best shoes, but to also to find the best provider of custom orthotics if they are prescribed for you. Here’s my latest video shoe review on Asics Gel-Kayano 17. Unfortunately, the current Gel-Kayano is a shoe I just can’t endorse. Hopefully, Gel-Kayano 18 will make me a believer again. Asics GT-2160 is the perfect shoe for a narrow, shallow foot https://drshoe.wordpress.com/2008/01/14/narrow-vs-wide-feet/. It also works for the medium foot, easily accepts an orthotic and provides lots of support. Here’s my video review on this great shoe.